This monster is, to my knowledge, the largest snow crystal ever photographed. It measures 10.1 mm (0.4 inches) from tip to tip (averaged over the three axes). Even using my microscope's lowest magnification, I had to photograph the crystal in four quadrants, which I later recombined digitally into a single large image. Click on the picture for an even larger view (if you dare). 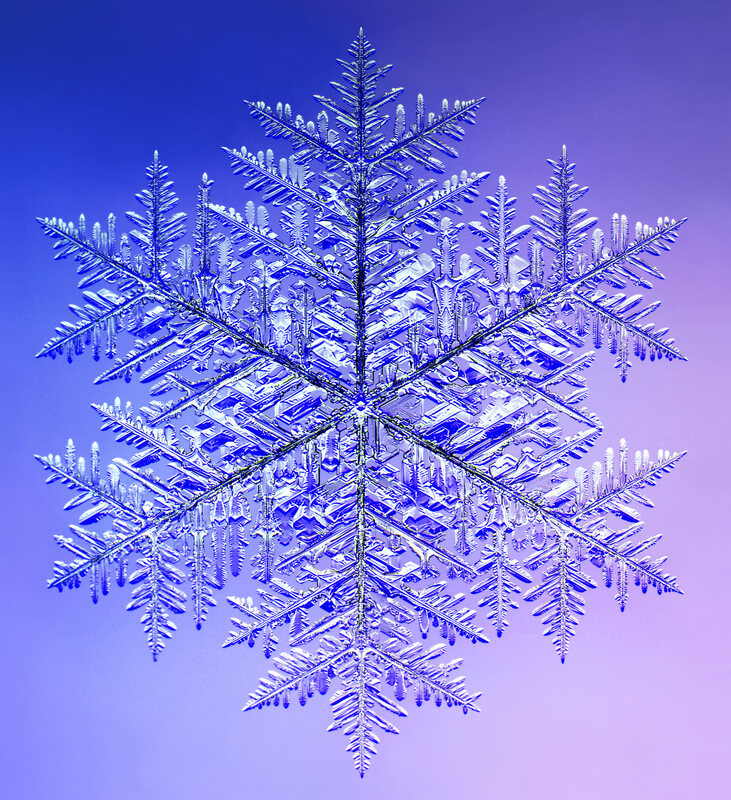 Note that this is a snow crystal: a single crystal of ice, in which the water molecules are all lined up in a regular crystalline lattice from tip to tip. You can see that the sidebranches are parallel to their neighboring main branches; this indicates the presence of crystal symmetry. Larger snowflakes have been reported, but those were puffballs made of huge numbers of individual snow crystals stuck together. During very calm conditions, these puffballs can grow into pancake-shaped agglomerations as large as a dinner plate, although this is exceedingly rare. Such large snowflakes are quite fragile, falling apart when they hit the ground. I have only seen large snow crystals like this twice; both times in Cochrane, Ontario. The temperature was near -15 C (5 F) -- just right for making fernlike stellar dendrites (see the Guide to Snowflakes) -- and the air was dead calm. Both times, I saw these large snow flowers falling only briefly, for about ten minutes. 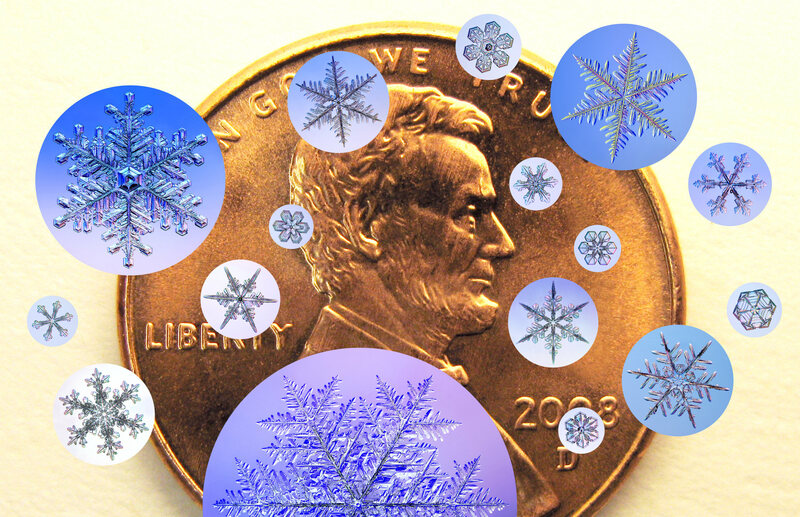 This image shows the sizes of several snow crystals -- including the monster crystal -- compared to a penny.